Shihan Des Paroz, holds a 6th Dan Black Belt degree in Shorinjiryu Koshinkai Karatedo, and is the dojo instructor for the Kengokan Dojo located in Sydney, Australia. Shihan Paroz also hold a 6th Dan Black Belt from the Shorinjiryu Shinzen Kyokai of New York, USA. Shihan Paroz serves as president of the Australian Shorinjiryu Karatedo Association, and is a Technical Advisor to the International Budo Institute where he holds the rank of 6th dan. 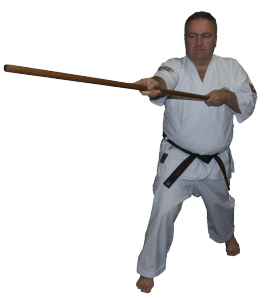 Shihan Paroz commenced training in Shorinjiryu Karatedo in 1983, and has been a student of Shihan Phil Hooper and Kyoshi Jim Griffin. Shihan Paroz spent 2 years in Japan in the early 1990’s, where he trained daily at the Combined World Headquaters and International Hombu dojo of Shorinjiryu Kenkokan Karatedo as a personal student of Hanshi Masayuki Hisataka, 9th Dan. In that time, Hanshi Hisataka and Shihan Paroz co-wrote the manuscript that formed the basis of the book published as Essential Shorinjiryu Karatedo. Shihan Paroz also assisted Hanshi Hisataka during a seminar tour to Europe in 1993. Academically, Shihan Paroz holds a Bachelor of Economics from the University of Queensland and a Master of Commerce from the University of NSW. Shihan Paroz is self-employed as a trainer, consultant and writer. As a PADI Course Director in scuba diving, Shihan Paroz “teaches people to teach people to blow bubbles underwater”, and is an instructor-trainer in CPR, general first aid and diving first aid. He is also a proud member of the Australian Armed Forces.